Erika Andersen is the founding partner of Proteus, a coaching, consulting and training firm that focuses on leader readiness. She and her colleagues at Proteus support leaders at all levels, helping executives get ready and stay ready to meet whatever the future might bring. Erika Andersen advises senior executives at companies including NBCUniversal, Tory Burch, GE, Madison Square Garden, Hulu, and Viacom, helping these leaders hone their focus on organizational visioning and strategy, team development, and their own management and leadership evolution. She also shares her insights about leading people, staying ready for the future, and creating successful businesses through her books and speaking engagements, and via social media. Erika is one of the most popular leadership bloggers at Forbes.com. In addition to Be Bad First: Get Good at Things Fast to Stay Ready for the Future, she is also the author of Leading So People Will Follow, Being Strategic, and Growing Great Employees, and the author and host of the Proteus Leader Show, a regular podcast that offers quick, practical support for leaders and managers. Everybody talks about strategy, but there is a big gap between discussing strategy and using a practically strategic approach to achieving the business, the career, or the life you most want. In this book, Erika Andersen offers you a step-by-step model and skills for making being strategic a powerful habit of mind and action. Growing Great Employees What it is: Introduces the “what, why and how” of people management, based on Erika's book Growing Great Employees. Provides a framework for participants to manage others well throughout their career. Who it’s for: Primarily for those who have responsibility for others’ success–-managers, executives, business owners, team leaders, project managers, entrepreneurs. 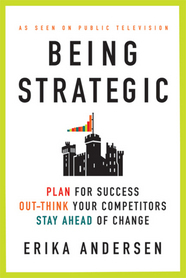 Being Strategic What it is: Demystifies the idea of strategy, using the model from Erika's book Being Strategic. Provides a practical, learnable approach to thinking and acting strategically, so participants can clarify the future they want to create and plan how to achieve it. Leading So People Will Follow What it is: Explores the model from Erika's book from Leading So People Will Follow for understanding core qualities people look for in those who lead them. Provides insight for developing those personal characteristics, essential to becoming a fully followable leader. Be Bad First What it is: Frames up why being a high-payoff learner is the key skill for success today. Provides grounding in the four mental skills from Erika's book Be Bad First that will allow participants to become masters of mastery. Inc. named Erika one of the top 100 leadership speakers of 2018. Read Erika Andersen’s most recent contributions to Forbes. Check out Erika Andersen’s consulting firm, Proteus. Learn more about Erika Andersen here and follow her on Twitter. "Erika provided to our conference attendees a thought-provoking, engaging, and interactive presentation on leadership and growth. She did a great job balancing useful information with clear and attainable steps of action that could be applied to each person in the room. We loved the interactive activity as well! I believe most people in the room would willingly choose to hear her speak again." Praise for Being Strategic “Unlike most experts in her field, Erika Andersen has an approach to being strategic that's sensible and accessible. With her, you feel capable of creating the business, career and life you want. She’s to strategy what Suze Orman is to personal finance!"